My second delivery from the USA arrived today with some additions to my fledgling 2014-15 Paramount Penmanship collection. Included within the package, were a couple of cards from the low numbered parallel gold version of the set. 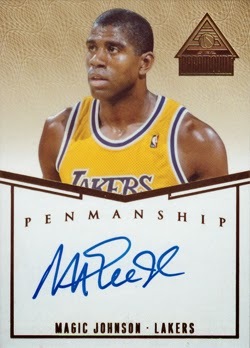 In terms of the players featured on the cards, first up — serial numbered three of ten — is a card from Laker great Magic Johnson. There is little that I can write about the greatest point guard to have ever have laced up a pair of basketball sneakers, that has not already been written before. So I will move onto the second card which features a journeyman guard who — ten years after entering the league became as the 51st pick — this season became an All-Star. Aged 34, Korver has emerged as a key part of the the Atlanta Hawks, that entered the playoffs as the Eastern Conference's No. 1 seed, with a record of 60-22. As I type, the Hawks have a 3-2 lead over the Wizards and Korver has possibly his best ever shot at playing in the NBA Finals for the first time. 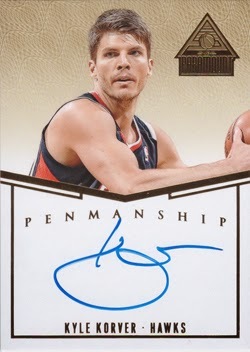 Korver's Penmanship Gold that today entered my personal collection, is serial numbered nine of ten. When compared to seeing the cards in person, the above scans simply do not do justice to the cards. The gold colouring really does 'pop' superbly on the white background of the card. Whilst my budget is going to prevent me from ever putting together a complete set of the gold parallel version of the Penmanship set, having now seen the cards in hand, I would like to add a few more reasonably priced versions to my collection. The trick is going to be finding the right players at the right price!